Get yourself to Tucson, Arizona and Elkhorn will provide complimentary shuttle service to and from the ranch, valued at $108 per person or $216 per couple. Use our “two week rate” for a one week stay, a 5% savings. Use our “three week rate” for a one week stay, a 12% saving. Book a November or early December 2018 (Thanksgiving week excluded) visit by June 1, 2018 and lock in the previous season 2017/2018 rates. The ERWEB2018 deal applies to arrival and departure dates prior to December 17, 2018 and reservations must be confirmed with a 25% deposit and completed registration form prior to June 1, 2018. Thanksgiving week November 18 – 26, 2018 is excluded from this deal, and you must choose only one deal. 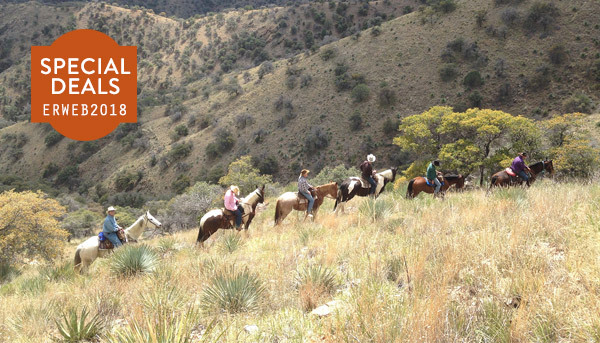 Learn about Elkhorn’s all-inclusive dude ranch American plan rate structure at our website. Please call 520-822-1040 or contact us to arrange your Arizona dude ranch vacation at Elkhorn Ranch and be sure to mention ERWEB2018 when you call or email. Diane, Grace and Mary look forward to your call!